Offering opportunities for young musicians to perform in public arranging concerts by established performers providing a platform for local schools and musical organisations. In an area lacking appropriate community venues, MASJ actively encourages the use of St John’s Church (which has wheelchair access) for events. MASJ also engages with local schools and with Dacorum Music School to educate young people and encourage their knowledge and love of music. Our UniSong events provide school children with a relaxed day of singing, and the UniSound events allow children from local schools to play a variety of instruments, in both cases ending with an informal concert for families and friends. The WOOFYT, a simple functioning organ made of wood, valves, pipes and a pump, has visited St John’s Church regularly to demonstrate the science behind an organ to children from local schools. MASJ has created a bursary scheme to offer financial support to young people in their musical journey. Details are given on the next page. 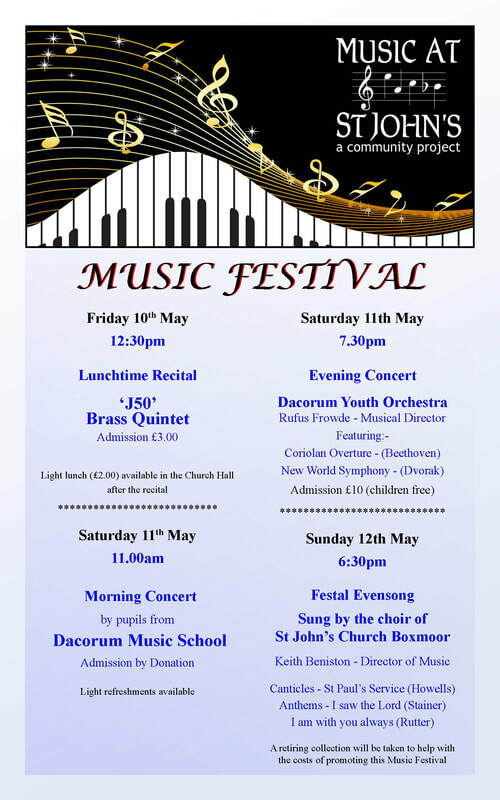 If you would like to support our work by sending a donation or joining the Friends of Music at St John’s, please see details of our current programme on this site. ​Music at St John’s Ltd. (MASJ) is pleased to offer discretionary non-competitive bursaries to young musicians. Bursaries are available to young people who are musically active with a school, church or musical organisation in the Boxmoor area. Bursaries are offered for a variety of purposes, such as - buying books or music directly related to the applicant’s music studies - the cost, in full or part, of attending a course - assisting with the payment of examination fees and associated costs - essential instrumental accessories or repairs. Applicants should not normally be older than 21 years of age and should be studying with a recognised and qualified music teacher. Applications for those under 18 should be made by a parent or guardian (not their teacher). Applicants should have already achieved some progress in their musical development to indicate their potential. For reference, this should be a Pass at Grade 3 or above of the ABRSM or Trinity London examinations. - Name and address of teacher. Completed Application Forms should be sent to the Secretary, Music at St John’s Ltd., c/o St John’s Church, Station Road, HEMEL HEMPSTEAD, Hertfordshire, HP1 1JY. Applications should be submitted before the closing dates of 30th September, 31st January or 31st May each year for any award to be made in the appropriate academic term. MASJ reserves the right to request further information from applicants or their teachers before considering applications, and will take into consideration the extent to which the applicant is able to contribute (for instance by self-supported sponsored activity). Successful applicants will be required to provide evidence of the proper use of any Bursary which is awarded.